I read Sherry’s review of Rose Under Fire by Elizabeth Wein and immediately clicked through to purchase a copy. Then it languished on the shelf for almost four months before its shortlisting for the YA fiction category of the Cybils prompted me to pick it up. After being completely blown away by Wein’s Code Name Verity, I knew this one would be one I wouldn’t be able to put down, and I was right. Rose Under Fire isn’t a sequel to Code Name Verity; instead, it’s sort of a companion novel, a novel with a few characters in common, as well as the general setting and time period. It’s the story of Rose Justice, an eighteen year old pilot from the U.S. who comes to Britain to fly, like Maddie Brodatt in Verity, for the ATA. The first third of the novel or so is about Rose’s experiences in war-time England–she’s just on the periphery of the war itself, losing a new friend in a crash after the friend tries to “tip” a German doodlebug–a winged bomb, an unmanned aircraft set on destruction–out of the air. Rose is one of Maddie’s bridesmaids when Maddie has a hasty war time wedding. Rose has her own soldier beau. In other words, her world has been upended by the war, but not in any real tragic way. Then, through a series of blunders brought on by her foolhardy courage in the air, Rose is captured by some Luftwaffe pilots and eventually ends up in Ravensbrück, the notorious Nazi work camp. What follows then is harrowing and heart wrenching and ultimately (but only ultimately) full of hope. Rose falls in with a surrogate family in Ravensbrück that includes her lagermutter (camp mother), Lisette, a French beauty who mothers the younger women after losing her Jewish husband and her three handsome sons to execution by the Nazis; a spitfire of a Polish girl, Róza, one of dozens of Ravensbrück “Rabbits,” the victims of unspeakable Nazi medical experiments; and Irina, a Red Army pilot–a double Ace, no less–who’s tough as nails and hates the Communists almost as much as she hates the Nazis. Ultimately, Rose and her unlikely family have a single goal: to tell the world about the Ravensbrück atrocities, specifically those committed against the Rabbits. This, along with the poetry Rose writes, is what keeps her and her friends going. I won’t reveal any more about the plot than this because this book is one best left unspoiled. Whew. What a story. I almost couldn’t read it fast enough, and yet, it is heartbreaking. Wein is definitely a master storyteller, and she withholds just enough information to keep from putting this one totally over the top in terms of heartbreak and misery. This one reads like an actual survivor’s story, though it is fiction. One of my favorite parts of Rose’s story is her poetry–it’s very, very good. Of course, I couldn’t help but think of Corrie Ten Boom’s The Hiding Place while I was reading this since Corrie and Betsie were held in Ravensbrück, too. The obvious differences are first the fact that Rose Under Fire is fictional; and second, Corrie and Betsie’s faith in Christ is front and center in The Hiding Place, while in Rose Under Fire the only reference to religion or any of its accoutrements that I recall is a reference to Lisette reminding the girls to pray over their food (and which Rose and Roza do later in remembrance of their lagermutter) and Rose’s thinking of herself as a “good little Lutheran girl.” While I definitely think both stories are worth reading (and I feel, to a certain extent, that we have an obligation to keep reading and writing about such atrocities), this one is definitely not for the faint of heart. Beyond the obvious subject matter concerns, this one contains quite a bit of foul language. While I don’t find it too off-putting given the subject matter, I know some of my readers will want to know it’s there. I also loved Rose Under Fire. After thinking about it a bit, I think it’s a less enjoyable book than Code Name Verity. Verity was just such a surprise, in that I read it without expectations and was blown away. And it had the mystery aspect. I read Rose Under Fire with all sorts of expectations. For the most part, it lived up to them but it was a more difficult book. In some ways, I think it’s the better book as it’s more rich and complex. But it’s like comparing really good chocolate cake and really good lemon meringue pie. Who cares which is better? Oh Yay! A finalist! That sounds absolutely interesting! That’s at my library! 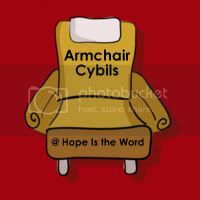 I’ve placed a hold and am planning to squeeze my way into reading at least a little for the Armchair Cybils! I also read this because of Code Name Verity. And while it wasn’t as exciting in that twist and turn way that Verity was, it was a compelling book in its own way. It is very difficult subject matter but it’s important. Wein is a wonderful writer.